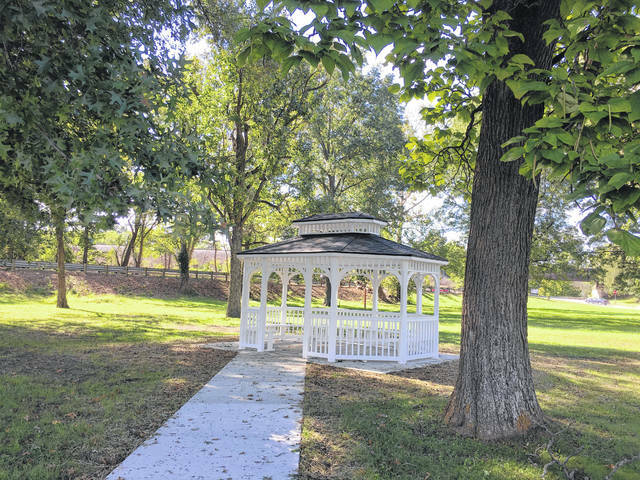 The Point Pleasant Wellness Committee/Walking Trail Committee is planning on upgrading “Claflin Corner” where the gazebo towards the end of the park is located off of the Robert and Louise Claflin Walking Trail. POINT PLEASANT — The Point Pleasant Wellness Committee/Walking Trail Committee is ready to move on to phase two of upgrading “Claflin Corner” at Krodel Park in Point Pleasant. In the fall of last year, after the Robert and Louise Claflin Walking Trail was completed, the Wellness Committee members decided to add a gazebo off to the side of the walking trail located near the park’s exit. Sidewalks were also added leading off of the walking trail into the gazebo. The first phase of this project was $17,000 and fully funded by the Robert and Louise Claflin Foundation. Representatives of the foundation asked if this portion of the park could be called Claflin Corner. Recently, Bob Rulen, chairman of the Wellness Committee, spoke with the Point Pleasant City Council members about further upgrades to Claflin Corner. The committee has planned to install the following items: two 46-square inch picnic tables that will have walk through benches and will be able to seat eight people at each table; one additional picnic table of the same design except it will be American Disabilities Act (ADA) approved, wheelchair accessible; theft protected trash receptacles; 320 square inch covered charcoal grill with a utility shelf and a 360 degree rotation capability; a metal water fountain; a doggy pot which will feature an aluminum bag container that will hold litter pick up bags and a 10 gallon trash receptacle for individuals to dispose of their pets’ waste; and three street scape decorative LED lights which will feature an acrylic acorn translucent glow poly-carbonated base mounted on eight feet-by-three inch diameter aluminum poles. The total cost of this upgrade will be just under $10,000 and will once again be fully funded by the Claflin Foundation. Stephen Littlepage, president of the Claflin Foundation, added they will be needing some assistance from the city for some labor as well as access to a water line and access to electricity. Jan Haddox will be making a Claflin Corner/Claflin Walkway sign to be located near the entrance of the gazebo and Brent Hereford’s welding class from the Mason County Career Center will be doing work on Krodel Park’s sign adding a vinyl covering to the wooden poles. Both of these jobs will also be fully funded through the Claflin Foundation. https://www.mydailyregister.com/wp-content/uploads/sites/24/2019/04/web1_1003.Gazebo.jpgThe Point Pleasant Wellness Committee/Walking Trail Committee is planning on upgrading “Claflin Corner” where the gazebo towards the end of the park is located off of the Robert and Louise Claflin Walking Trail.